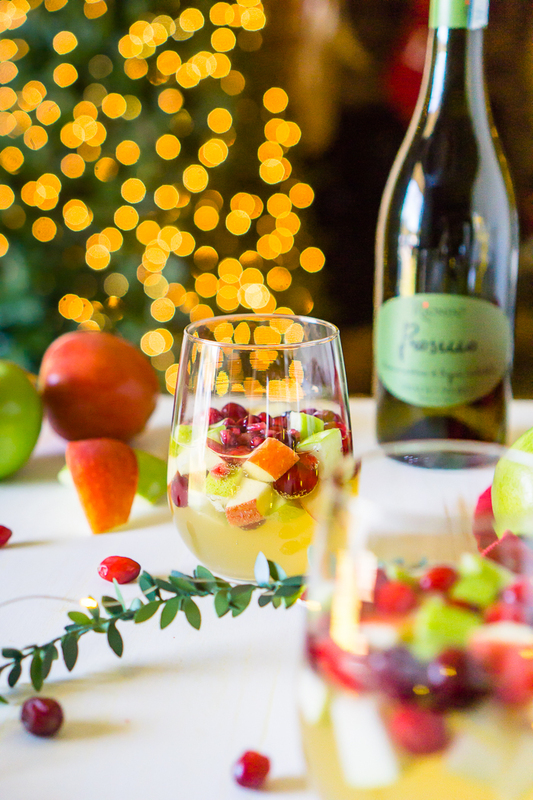 I’m dreaming of a White Christmas Sangria, filled with tasty red and green fruit for a festive holiday cocktail! Just fill up the sangria pitcher with red and green apples, pears, cranberries and pomegranates, and some white wine and Prosecco, too, of course! Lightly sweet and tangy fruit makes for a Christmas Sangria Recipe your guests will love! Deck the Halls with this Festive Sparkling Sangria! We are a big Christmas family! The lights, the music, the stories, the movies, the cookies, and, of course, the decorations — we love it all! I mean, we are the people who have our Christmas tree up on Nov. 1 every year. But most of all, we love the extra time spent with friends and family, and that alone deserves a fun holiday cocktail! I thought it was time to add a sparkling holiday drink to the mix in honor of my favorite Christmas movie: White Christmas! 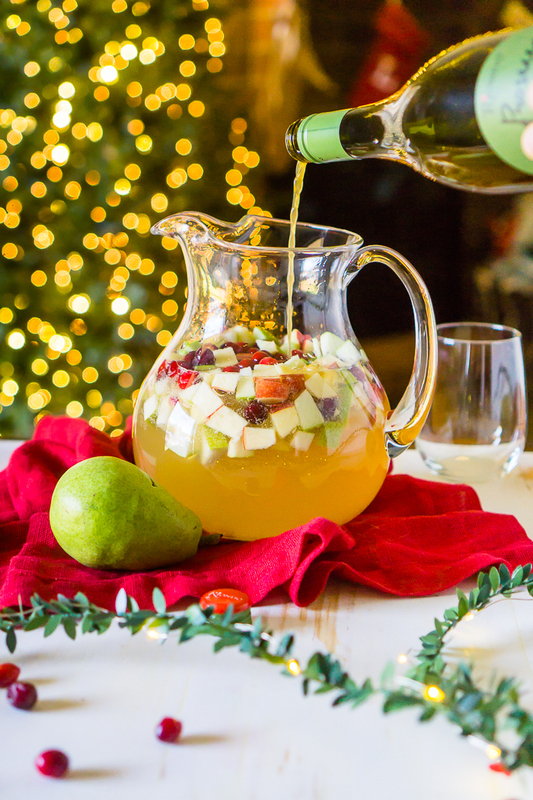 Enter this White Christmas Sangria! My in-laws, especially my husband’s aunt, have turned me into a bubbly-lover! While a bottle of Prosecco does­n’t need to be saved for a special occasion to be enjoyed, it does make every occasion feel a little extra special and fun, which is why I decided to make my White Christmas Sangria a sparkling sangria this year! 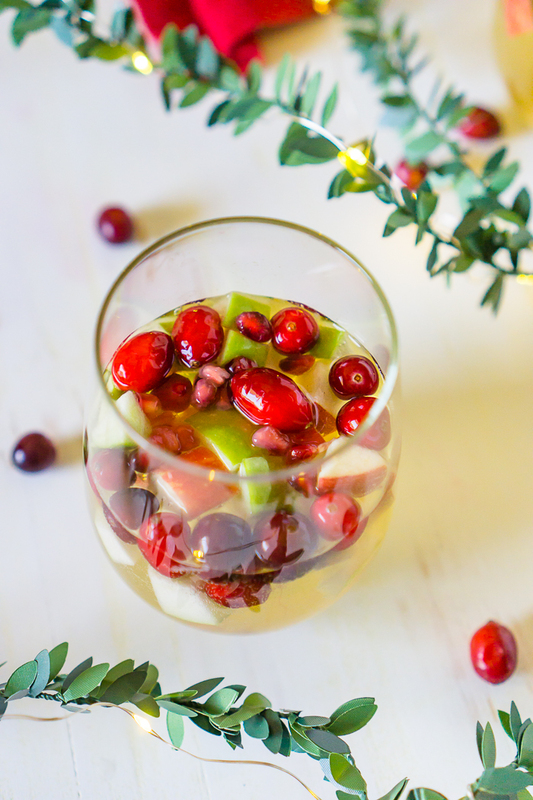 Between the bubbles and the red and green fruit inside this white sangria recipe, you have a festive holiday cocktail to add to your Christmas parties or holiday menu! Plus, sangrias are so easy to make in large batches for guests so you won’t need to play bartender without losing out on any of the pretty presentation. While I have a few different holiday cocktail recipes on the blog, sangria recipes are always my go-to holiday cocktails because they look so pretty and festive without a lot of work. Plus, you don’t need a lot of cocktail-making know-how. Simply chop up some fruit, add a couple of liquid ingredients, and let it sit! When I have the time, I love to add the fruit to the wine the night before so the fruit has time to soak. Watch out for the cranberries! Their tanginess is definitely magnified in the sangria when you eat them after soaking, which I love, but Bryan’s a little unsure about. He says he will stick to the apples and pears in his glass. For champagne cocktail recipes or in this case Prosecco cocktail recipes, I suggest adding the sparkling ingredient as close to enjoying the mix as possible so the bubbles don’t go flat! 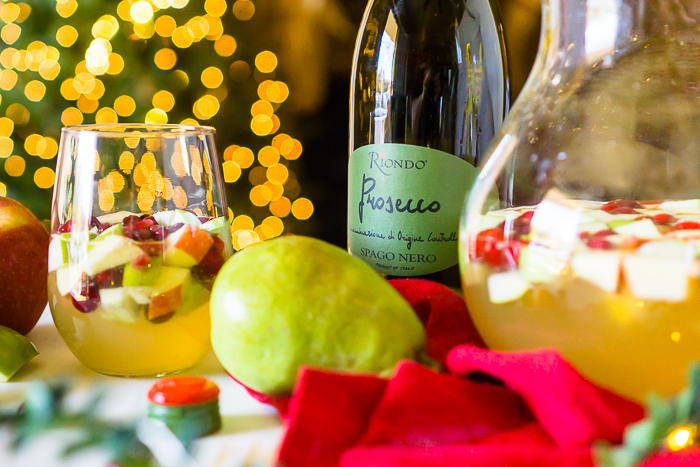 For this sparkling White Christmas Sangria, you can either add the Riondo Prosecco right before guests arrive or allow them to pour it straight into their glasses as a finisher. Riondo Prosecco is definitely my go-to Prosecco! It’s a slightly fruity option with a crisp, clean finish that’s easy to enjoy by itself after work or with friends for girls’ night while also making a great ingredient for a Prosecco cocktail. Need more convincing? It is an authentic Italian import beverage with an approachable price point and the go-to refreshing beverage for the holidays, either with friends or alone. You might be unfamiliar with sangria; I certainly didn’t grow up with it being served around my house or at family functions. So here is a quick explanation of sangria: The basic ingredients you find in sangria recipes are wine, a sweetener of some sort, a liqueur, a soda or non-alcoholic mixer, and fruit. TIPS FOR MAKING YOUR OWN SANGRIA? Traditional Spanish sangria’s tend to use red wine as a base, but anything goes when it comes to sangria recipes! I’ve made white wine sangrias, sparkling sangrias like this one, rose sangrias and red wine sangrias, and I have loved them all for different occasions! WINE: Most white wines work well for sangria; however, you do not want to use an oaked wine. This is most important if choosing to use a chardonnay. I primarily tend to use a Sauvignon Blanc or Pinot Grigio. For red wine, a Spanish wine is always a good choice, as well as a Merlot, Cabernet Sauvignon or Pinot Noir. While you want something tasty, you do not need to buy an expensive wine for sangria as it will lose it’s complexity as you add more ingredients into the punch. FRUIT: Citrus fruits like lemons, limes, and oranges, stone fruits like peaches, nectarines, cherries, and plums, pome fruits like apples and pears, tropical fruit like pineapple and mango, and berries. Softer fruits like berries or melon balls should be added closer to serving instead of the night below; otherwise they might get a little mushy. BUBBLES: If you’re adding anything with bubbles, such as club soda, it is best to add right before serving to maintain the fizz it gives. This is the same for sparkling wine. WHITE CRANBERRY MARGARITAS <— ONE OF MY ALL TIME FAVES! You can also use a punch bowl! Now It’s Time to Start Making your Sparkling Holiday Sangria! 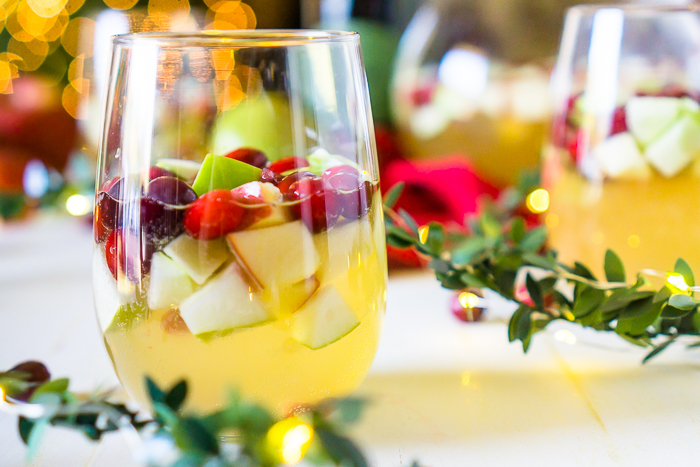 I'm dreaming of a White Christmas Sangria, filled with tasty red and green fruit for a festive holiday cocktail! Lightly sweet and tangy fruit makes a Christmas Sangria Recipe your guests will love! Add all ingredients except the Prosecco to the pitcher and allow fruit to soak for at least a few hours. When ready to serve, add in the Prosecco and enjoy!